1/4-inch tubing compatible with most brands of 1/4-inch irrigation fittings, such as barbed fittings, emitters, mister and so on. It can handle up to 60 PSI and is not rated for constant pressure. Before assembling, please put the connected part of the tubing into hot water for 10 seconds. －It's manufactured from high quality polyethylene resigns and UV inhibitors. no waste odor, soft material, the inner wall is smooth, durable, anti sun, not easy to aging. －1/4" micro hose is most-often run from 1/2" drip hose to individual plants with a drip emitter at the end. －This kind of solid poly micro hose is used widely with drip irrigation for main and lateral water lines. －Up To 70% Water Savings:Eliminates wasteful overspray and runoff of overhead sprays and hose end sprinkling. -Material:New Environmental Protection Material（PVC）.No Waste Odor. The Inner Wall is Smooth. Unmatched Resistance to Chemicals, Ensuring a Long Service Life . 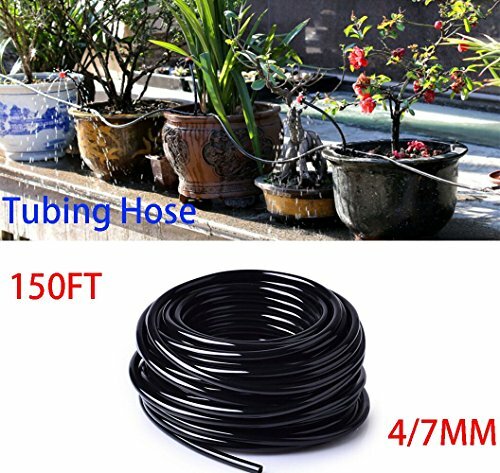 -Function：Suitable for The Over Water Pipeline of Micro Sprinkler, Spray Irrigation and Other Micro Spray Products.Agriculture, lawn, Garden and Industrial Irrigation Hoses. -Size:Outside Diameter 1/4 Quarter inch 6.5mm, Inside Diameter 0.16 Inch 4.0mm,Inside/Outside Wall Thickness 1.4mm. -Connect：Industry Leading Flexibility Allows Tighter Turns With Fewer Elbows for Fast, Easy Installation in Garden, Flower Bed, Ground Cover or Other Iandscaped Areas. -We Want You to Love the Product & Encourage You to Place Your Order with Confidence. All of Our Product are Backed by a Full 100% Satisfaction Guarantee. If You Have Any Questions About Our Products, Please Contact us in Time, We Promise to Give You a Satisfactory Answer. If you have any questions about this product by Househelper, contact us by completing and submitting the form below. If you are looking for a specif part number, please include it with your message.